SearchReSearch: Answer: Where are you? nice one with the reflected logo :) i got to the right address by searching "westin near pzu" on google maps. After that, all my time was spent trying to align the view on google earth with the image. This actually happened to me once. But I asked the person beside me where I was and she told me. i hope you didn't send your medicine to the wrong floor! seriously, how can you tell we're on the 10th floor and not the 8th? The extra credit asked for an office number. I am curious how to find that out. I had trouble with that. And did you just pick the 10th floor over the 8th just bacause it was closer to your google earth height estimate? Apparently office floors can vary greatly in height. I zoomed in to see the logo on the tall building in the background, and then did a Google image search for "pzu", because it seemed to be an easier term to search than "tp". I saw a likely looking building on the first page of results, and it came from a site called "Skyscrapers of Warsaw": http://wiezowce.waw.pl/pzu_en.php. Looking at the pulldown menu for existing skyscrapers, I saw a page for TPSA tower, with an address of ul. Twarda 14/16, which I plugged into Google Maps. After zooming in for a better view, which happened to be the same perspective as the mystery photo, I noticed a nearby building with the label "Google Poland". No extra credit for me, though, because I didn't figure out the floor; I'd have to take delivery in the lobby. Bizarre experience -- I have been battling and battling to find the TP building in the 3-D view. I have finally realized that it simply is not there. I can find surrounding buildings and landmarks, and I can even find a link the the TP Building, but the building itself is not present in the 3-D model I am currently looking at. It's a bit false though, isn't it? You chose the solution, the Google Building and worked backwards to create the problem. If that reflection of that logo had not been there and if the natural assumption that you'd chosen google didn't prompt (the "surprise" as you put it), then the task would be much harder. Pick an image of a genuinely random building and do it and I'd be convinced. Maybe he knows there are SpongeBob Squarepants stickers on the windows of the 8th floor. I am a commercial insurance underwriter and use this type of search functionality every day. I love Google, it keeps my agents and insureds honest. Okay and I thought I was a great stalker. I yield to the master! And I thought I was a great stalker. I yield to the master. I got it! Much the same way as described: TP Tower in Image to Google Maps. I didn't bother much with the rotation in the map, but noticed one building was labeled as Google Poland and thought, "You clever devils." 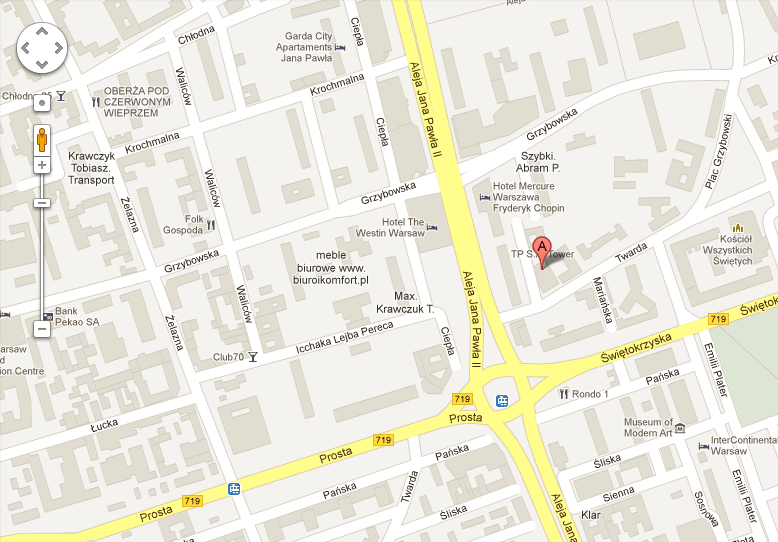 Then it was a matter of looking up the details for Google Poland. Good fun! But again, that "surprise" (you clever devils) makes it a false problem. Pick a random building that isn't a Google HQ somewhere (giving you the key to know the floor and the number) and show me that you can pinpoint the window and the phone number. Hmmm... isn't it just possible that the photo was taken by a Google employee who visted a friend's office on the 9th floor to take the picutre-- since that blue Google logo messes up the 8th and 10 floor views?! It took me about 4 minutes. I looked at the logos on the towers--in this case PZU and TP--and searched on those. PZU brought up a Polish insurance company. I then did a Google Maps search of the PZU Tower in Warsaw (assuming the city I was looking at was probably Warsaw) and bingo--found it. Then navigated the city streets until I was at the base of TP Tower, the building in the foreground. Navigated a couple of blocks away to the tallest building in the southeasterly direction, and noted the address. 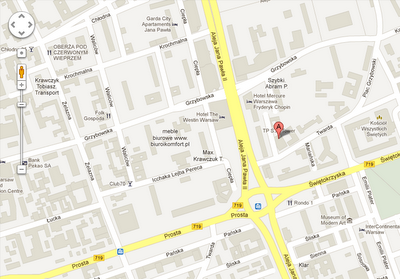 Did a Google search of the address and found that Google Poland is in the building (of course!) From there, the rest was easy. :-) Fun challenge! Instead of studying the picture as the first step, I just clicked on the photo and dragged it into my browser's Google Search box. Then I switched to the Google Images search and it showed "similar photos." The very top results showed that we were looking at the TP Tower in Warsaw, so within seconds I was able to search for that in Google maps. I think the drag-and-drop into Google Images search is a more reliable approach if you don't have a logo on a building. Like Abby, I found the * search trick in Google Maps to be very useful in this exercise. I always enjoy using Google Earth, too (when I'm on a good computer that doesn't freeze when I try to work too fast in it). I knew where it was just by looking at the picture. Hm! Looks like Warsaw. Hm! PZU building. Ah, that was close to the hotel I stayed in two years ago. What a brilliant example - thanks for sharing it!